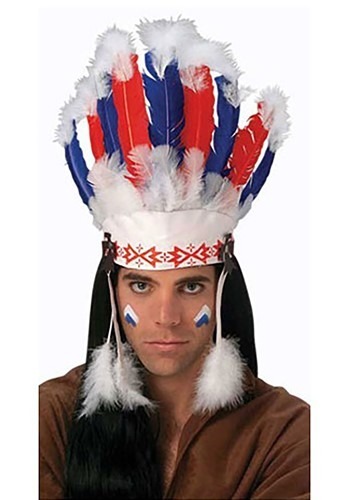 This is a Native American-inspired headdress with red, white, and blue (or black) feathers that give this piece a rustic look along with a printed pattern on the headband. Smaller feathers hang down the sides on strips. Just be aware, these may appear slightly different than the one pictured because of manufacturer changes. Where this headdress and you will have a look out of film westerns from the 50s and 60s. While not authentic, it is truly eye-catching.